Q: Recent days have seen sound interactions between the DPRK and the ROK as well as between the DPRK and the US. Positive progress has been made on the political settlement of the Korean Peninsula issue. The DPRK and the ROK reached broad consensus on implementing the Panmunjom Declaration, setting up joint liaison offices and holding military, sports and red-cross talks. When Vice Chairman Kim Yong Chol of the Central Committee of the Workers' Party of Korea wrapped up his visit to the US, US President Trump said that the US-DPRK summit will go on as scheduled. What is your comment? A: Recently, the situation on the Korean Peninsula has been improving and positive steps have been taken to improve the DPRK-ROK relations and DPRK-US contacts and dialogues. China welcomes and supports the latest round of high-level talks between the DPRK and the ROK which has resulted in positive outcomes. Under the current circumstances, the DPRK and the ROK implementing the Panmunjom Declaration and promoting reconciliation and cooperation is conducive to consolidating the momentum of détente and dialogue on the Korean Peninsula. We hope that the DPRK and the ROK could continue to engage in dialogues, strive for better ties, and work positively towards the denuclearization of the Korean Peninsula and the political settlement of the Korean Peninsula issue. Vice Chairman Kim Yong Chol of the Central Committee of the Workers' Party of Korea has returned from the US where the DPRK and the US sides held close talks on the DPRK-US summit and made positive progress. We are pleased with this important step made along the right path towards the political settlement of the Korean Peninsula issue. We have stressed many times that the Korean Peninsula situation is presented with a rare historic opportunity, and the DPRK-US summit is key to finding a path to the Korean Peninsula denuclearization and enduring peace. We hope that the DPRK and the US could meet each other halfway, demonstrate goodwill to each other, actively move forward their preparations for the summit, and strive for a result that is expected not only by themselves but also by the international community, thus contributing to ushering in a new era of a nuclear-free, peaceful and prosperous Korean Peninsula. We will support their efforts to this end. Q: Will Vice Chairman Kim Yong Chol inform the Chinese side of his trip in the US? Can you confirm that he will meet with Chinese officials? A: I have no information to offer in that regard. Q: The latest China-US trade talks ended over the weekend. This time is China's turn to hold the trade talks. Presumably, the next round of trade talks, whenever they happen, will be in the United States. Can you give us a timeframe for when the next round of trade talks may happen? Have you nailed down when the next meeting will be held? Does Vice Premier Liu have any plans at the moment to visit the United States to continue these trade discussions? A: I can see your interest in the trade talks between China and the US, and your hope that China and the US could resolve these trade problems through talks. China has already issued a statement regarding this round of China-US trade talks. 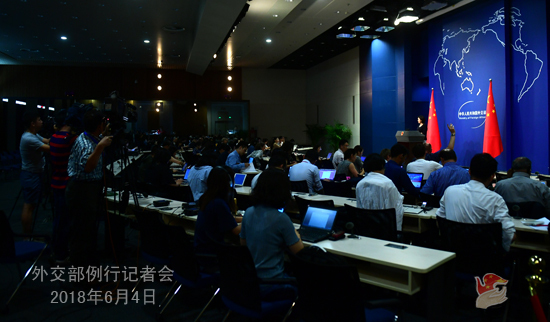 As for whether China will go to the US for the next round of talks, or vice versa, I would refer you to the Commerce Ministry for more information. China's principled position is clear. Our door is always open to negotiations. Q: There are news that after the US withdrew from the JCPOA, some companies are getting out of the Iranian market. Can you tell us whether Chinese companies are going out of Iran or they would stay? A: On the JCPOA, China has talked about its position many times. State Councilor and Foreign Minister Wang Yi explained China's position again when he met the press the other day with Federica Mogherini, the High Representative of the EU for Foreign Affairs and Security Policy, in Brussels. We believe that observing international agreements is one of the basics of international law, and major countries should lead by example. China will stand with the EU to firmly uphold the sanctity and authority of the JCPOA. 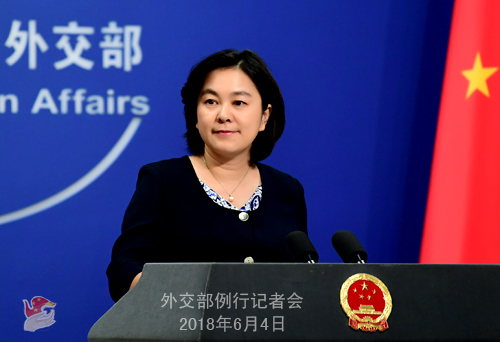 As for whether Chinese companies will get out of Iran, I would like to reiterate that the Chinese government opposes one country imposing unilateral sanctions on others in accordance with its domestic laws. 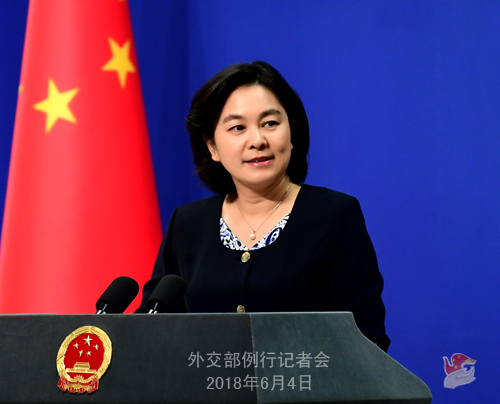 China and Iran maintain normal economic and trade ties, and we will continue cooperating with Iran on the basis of not violating our international obligations. Q: Indian Prime Minister Narendra Modi said in his keynote speech at the Shangri-La Dialogue that Asia and the world will have a better future when India and China work together with trust and confidence. India and China have displayed maturity and wisdom in managing issues and ensuring a peaceful border. His speech has many facets as regards the India-China relations and India's strategies and outlook on the world. What is your comment? A: We have noted and highly commend these positive remarks by Prime Minister Modi on China-India relations. President Xi Jinping and Prime Minister Modi had a successful informal meeting in Wuhan at the end of April. They had a robust exchange of views and reached extensive consensus on the international situation and bilateral relations, including on handling disputes and issues with maturity and wisdom through peaceful dialogues. All these have enhanced our mutual trust. China stands ready to work with India to implement the important consensus reached between the two leaders, sustain the hard-won and positive developing momentum for bilateral relations, enhance political mutual trust, promote mutually beneficial cooperation, properly handle differences, uphold peace and tranquility in the border areas, and ensure the sound and steady development of China-India relations. Q: Last Friday, a new interim government took office in Pakistan. This government will hold a general election in Pakistan on July 25. What is China's comment? A: We have noted that Pakistan will hold a general election at the end of July. We sincerely hope that Pakistan could go through this major political process steadily and smoothly. We believe that the all-weather strategic cooperative partnership between China and Pakistan will continue with its sound development, regardless of the results of the election.